What do you do when you have too many apples and not enough time to eat them all? And an old partial pack of phyllo in the refrigerator? This! What a great way to use your extra apples. Peel, core, slice the apples. Melt butter, add apples, sugar and spices. Cover and simmer for about 20 minutes or until soft. Preheat oven to 350. Melt unsalted butter. Unroll the phyllo dough on a cookie sheet. Cut to fit for use in a cupcake tin ) about 3/4 of a sheet. 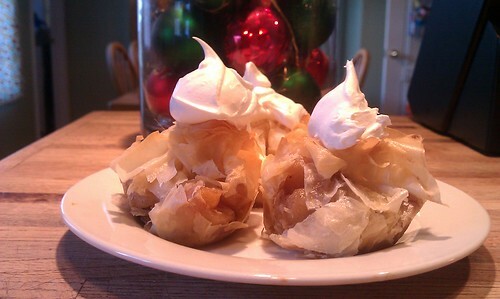 Brush the melted butter on a sheet of phyllo. Place in cupcake tin and twist wrap the top. Repeat. Bake for 12 minutes or until brown. Serve with whipped cream.